No red dye in this Red velvet cake? You bet. Beets act as a natural food colouring giving it a very deep red colouring. Using raw beets and adding lemon juice for acidity helps retain their colour, making the cake even redder. No one will know there are any vegetables in there, so we won’t tell if you don’t! This Red Velvet Beet Cake is easy to make and tasty to eat! It is a very delicious and healthier alternative for a very moist cake! Love using the beets as a “secret ingredient” for moisture. Aside from the fibre-fabulousness of beets and their other benefits (from being touted as detoxifying and anti-inflammatory to being a source of vitamin C), this recipe replaces the butter with extra-virgin olive oil. Surprisingly good, healthy, fluffy and moist. And it also serves its purpose to get rid of extra beets you may have. I like it with this shiny Chocolate icing Fast2eat Recipe (AKA Brigadeiro), but next time I will try with a cream cheese frosting, as on a traditional Red Velvet. This beet cake recipe is similar to one for carrot cake but with a bright red batter instead of the lovely light orange colour. You’ve probably heard a lot of back and forth about heart health, trans fatty acids, saturated fatty acids, PUFAs (Polyunsaturated fatty acids), MUFAs (Monounsaturated fatty acids) and smoke points when it comes to cooking oils. It can all be a bit confusing, so this article is here to clear it up. Olive oil is my favourite. Because of its prominent role in the Mediterranean diet, olive oil is one of the most popular oils in many kitchens. Olive oil is a basic ingredient of the heart-healthy. Olive oils typically have the highest percentage of monounsaturated fats among cooking oils (although some high-oleic versions of other oils may have artificially boosted levels of monounsaturated fats). Olive oil is also rich in antioxidants called polyphenols, beneficial plant compounds that some evidence suggests may improve heart health. Made from: Extracted from ripe olives (fruit of the olive tree) on the first pressing without the use of heat or chemicals. Best for: It is best flavoursome oil for cold food (like drizzling over foods, on salads, pasta, and bread), but can be used in some low-heat cooking. Choose Extra Virgin (unrefined) for dressing and low-heat applications so you’ll be able to enjoy its robust flavour. Choose Virgin (also unrefined) or Pure (a blend of virgin and refined oils) for pan-frying, roasting, or baking. Not recommended: It’s okay to use the oil for a quick sauté or for baking, but it has a low smoke point, do it is not ideal for cooking unless below the smoke point. it’s not good for deep frying. Pros: It’s rich in polyphenols, antioxidant compounds that have anti-inflammatory properties. Researchers are also looking into how polyphenols can help to prevent cancer, as well as their potential for improving cognitive function and memory. High in beneficial monounsaturated fats, olive oil is heart-healthy. Cons: Olive oil has a relatively lower smoke point compared to other oils, so it’s best for low and medium-heat cooking; it’s not good for high-heat cooking. Note1: Many brands, varying in colour and strength of flavour, are now available. When choosing olive oil, look for ones that say they’re cold pressed. This is a chemical-free process that means no heat was applied during the crushing, which avoids changes in the olive’s chemistry and avoids defects. The resulting oil has a natural level of low acidity. Note2: Unfortunately, it has been discovered that some unsavoury olive oil dealers have combined olive oil with cheap vegetable oils while still labelling the bottle as 100% olive oil, so make sure the olive oil you buy is pure, otherwise you may unwittingly be consuming unhealthy oils. How to store: Store in an airtight container away from heat and light. Smoke point: 190-243°C (374-470°F), depending on variety. Extra Virgin is the highest grade and best tasting Olive Oil derived by cold mechanical extraction (always cold-pressed) without the use of solvents or refining methods. It contains no more than 0.8% free acidity, and is judged to have a superior taste, is considered the finest and fruitiest of the bunch and no defined sensory defects. This also makes it the most expensive to buy than other types of olive oil, but its flavour can’t be substituted for anything else and contains the most antioxidants. Made from: Extra-virgin olive oil comes from the first pressing of the olives. This results in an oil that has more flavour and a fruity aroma, and is less processed, meaning it is considered “unrefined“. Best for: Because extra-virgin olive oil offers more flavour than other types of olive oil, it’s a good option for sautéing vegetables, dipping bread or preparing salad dressings and marinades. It’s also one of the healthiest oils to use when baking. As a dressing, it’s great, too. Not recommended for: Frying or roasting above 190°C (374°F). There are better choices than extra-virgin olive oil for cooking at high temperatures, such as when frying because the oil cannot withstand very high heat before it starts to burn and smoke, Refined (or pure) olive oil may be more suited for high-temperature cooking. Pros: It’s high in heart-healthy monounsaturated fats and a quality bottle can truly take you on a taste bud adventure. Nutrition and cooking experts agree that one of the most versatile and healthy oils to cook with and eat is olive oil, as long as it’s extra virgin. You want an oil that is not refined and overly processed. An “extra virgin” label means that the olive oil is not refined, and therefore of high quality. 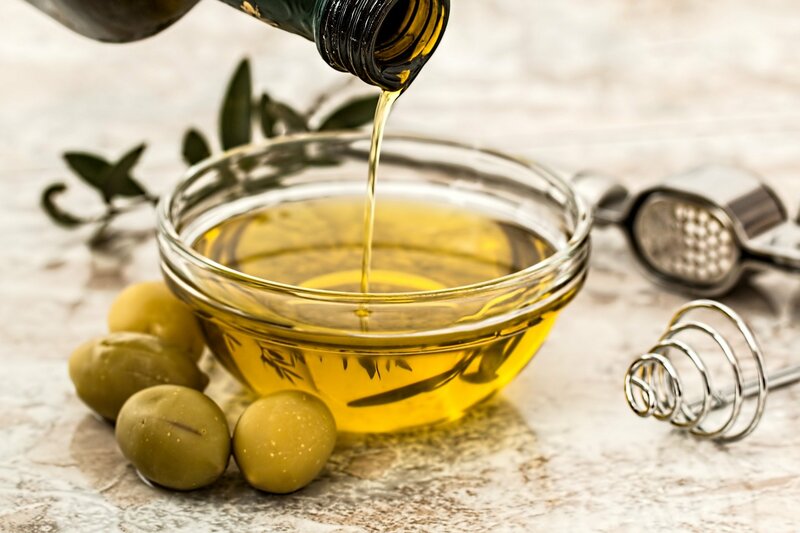 Extra virgin olive oil contains a large amount of monounsaturated fats and some polyunsaturated fatty acids; many studies have linked it to better heart health. Choose extra virgin olive oil for its flavour and high level of antioxidants. Cons: There’s one catch with extra-virgin versus other grades of olive oil: It has a relatively low smoke point, which means you may not want to use it for frying or roasting at temperatures above that smoke point. Must come from the first pressing of fresh olives, normally within 24 hours of harvesting. Must be extracted by non-chemical, mechanical means, and without the use of excessive heat, specifically below 28°C (82°F). The free fatty acid or acidity level must be less than 0.8%. It must be defect free – having a perfect taste and aroma. Virgin olive oil is a lesser grade of virgin oil. This is also first-press olive oil, however, it has between 1 and 3 % acidity, therefore, it is of inferior quality to Extra Virgin Olive Oil. If you’re unable to find extra virgin olive oil this is the next best option. It is judged to have a good taste but may include some sensory defects. Its flavour intensity can vary and its taste is milder than Extra Virgin Olive Oil. Meaning fine in Italia, this oil is a blend of extra virgin and virgin olive oils. Pure olive oil is another oil, but the name can be misleading. Pure is actually a blend of either extra virgin or virgin olive oil and olive oils that are refined. It is used mainly when extracted olive oil is of poor quality and the refining process helps it to have a better flavour. 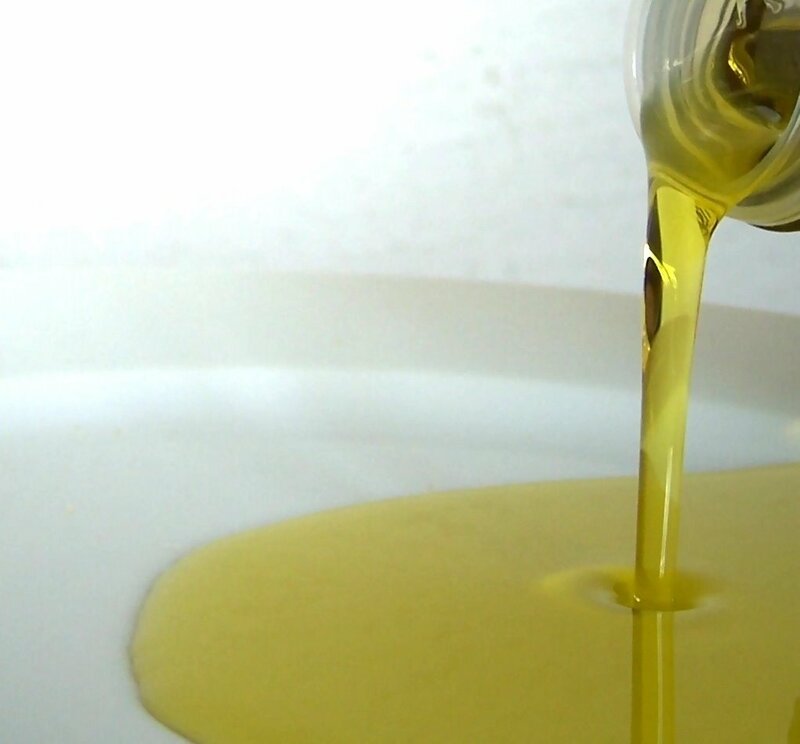 Refined olive oil is virgin oil that has been refined using agents such as acids, alkalis, charcoal, and other chemical and physical filters, methods which do not alter the glyceridic structure, and heat to extract as much oil as possible from the olive pulp that remains after the first pressing. These are heavily processed oils that have had most of their distinct flavours and aromas removed in the extraction process. Best for: Frying – If you love frying things in olive oil (which, like, who doesn’t?) you’ll want to use the pure stuff instead of Extra Virgin Olive Oil. Not recommended for: Salad dressings. Cons: Unfortunately, it’s not quite as flavourful, because it’s chemically processed. It also doesn’t have as many heart-healthy fats as high-quality extra-virgin. While it is still a source of monounsaturated fat, it no longer contains the polyphenols that make olive oil so good for you. The result is a fattier and more acidic oil which lacks taste, aroma and natural antioxidants. But that’s the trade-off for being able to use it for heavy duty cooking. Note: Many times, refined olive oil is used when frying as the taste is not as remarkable as the virgin oils. A product labelled simply Olive Oil is nearly the same as something marked Pure Olive Oil in that it is refined with lack of taste. This is why producers need to add unrefined Extra Virgin or Virgin Olive Oil to impart some of flavour, colour, and aroma into the blend. Smoke point: 199-243°C (390-470°F), which can stand up to that frying heat. Terms such as “pure” or “100% pure” or “Light” are made up terms used by large producers and supermarkets. If the label states “pure” or “100% pure” or “Light” then the Olive Oil is a refined oil lacking the taste, aroma, and quality of Extra Virgin Olive Oil. Best for: A great choice for turning into sauces and mayonnaise, using in baking or using in places you don’t want a strong olive oil flavour. It also has a higher smoking point than other olive oils, making it ideal for high-heat cooking. Cons: A highly processed, light coloured oil with very little flavour. The lowest grade of olive oil made from the byproducts of extra virgin olive oil production. Olive skins, seeds, and pulp are heated and the remaining oil is extracted using hexane, a solvent. The result, pomace oil, is then put through the refining process, similar to pure or light olive oil. Pomace olive oil is bland and extremely low in antioxidants. Flaxseed has become more and more popular as a superfood recently, with its high fibre content and fairly high doses of omega-3 fatty acids from plant sources, which are extremely healthy for us, since omega-3 fatty acids decrease inflammation and control blood pressure. Flaxseed oil is one of best plant sources of three omega-3 fatty acids (olive and canola oils also contain omega-3s). You need dietary omega-3s since your body cannot make them on its own. Omega-3 fatty acids reduce inflammation and thus may help lower the risk of cancer, according to the MD Anderson Cancer Center. Also thought to be helpful in fighting heart disease, diabetes, and stroke. You may want to look into using it more often if you don’t eat a lot of fish, but it’s hard to consume enough to get the benefits offered by omega-3s in fish. Subtle taste makes it a healthy alternative for salads. It is also a good source of monounsaturated fatty acids to promote decreased total LDL cholesterol and increased HDL. Flaxseed oil also packs anti-inflammatory properties, keeping the body primed to ward off disease. 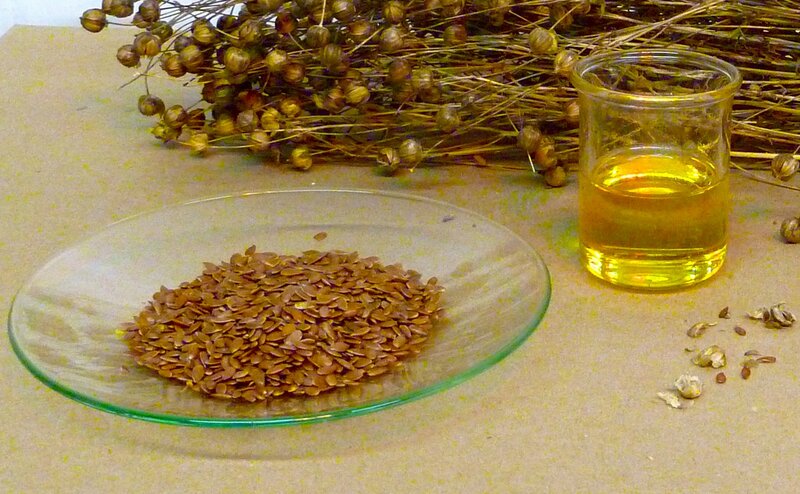 Flaxseed oil may also help reduce symptoms of arthritis. Best for: it’s best to use in cold dishes like smoothies or salads, so toss with a salad dressing or drizzling it over quinoa or dips like hummus. Not recommended for: Cooking. It should not be heated. You absolutely can’t cook with it, because of the low smoke-point, it’s incredibly sensitive to heat and oxidizes quickly. Pros: Since the oil is more condensed than whole flaxseeds, it provides a greater punch of omega-3s Flaxseed oil is also a terrific option for individuals suffering from high blood pressure, and studies show that supplementing with flaxseed oil on a daily basis can lower blood pressure and have a cardioprotective effect. Cons: Avoid it if you’re on a blood thinner since flaxseed oil may increase bleeding. It can go rancid very quickly (even faster if you heat it), so this oil should be stored in the fridge and only used for low-temperature applications like dressing salads. Other uses: the oil can be used as a mild laxative of sorts. On top of that, it’s also a solid option for moisturizing skin. You may also find this oil in various substances, like varnishes and paints, as a waterproofing agent. Note: you should buy small bottles so you can use it up quickly, and be extra sure to store it in the fridge. How to store: Cold-pressed flaxseed oil easily turns rancid (oxidizes easily), so buy it from the refrigerated section of the store, and keep it in your fridge at home. Smoke point: Unrefined – 107°C (225°F), don’t use this for cooking. Canola oil is one of the most neutral flavour options among all oils, making it extremely versatile. Made from canola seeds, a genetic variation of rapeseed, a flowering plant which is widely cultivated in Canada and is responsible for its name, a derivative of “Canadian oil, low acid.” (The “low acid” refers to versions of the rapeseed plant that are bred to have low erucic acid content. High levels of erucic acid can be toxic.). Canola oil also has relatively high monounsaturated fat content. But although it contains a higher proportion of monounsaturated fat (61-62 %), canola oil is also a good source of polyunsaturated fat (32 %). In addition, canola oil has the lowest level of saturated fat among cooking oils (7 %). It is also one of the few oils that contain a good plant-based source of omega-3 fats, a beneficial type of polyunsaturated fat. People often think of it as unhealthy because they associate it with fried food. It isn’t actually all that bad for you on its own. This is one of the healthiest oils available thanks to its fatty acid profile, omega-3 and low saturated fat contents. Canola oil is also very versatile as it has a neutral taste and light texture. The omega-3s and omega-6s may help with cardiovascular health. In 2006, the U.S. Food and Drug Administration (FDA) decided that manufacturers could claim that 1 1/2 tablespoons of canola oil a day may reduce the risk of coronary heart disease when used instead of saturated fat. Canola oil has a higher smoke point than olive oil and can be used safely for cooking at high temperatures. It doesn’t have as much flavour as some other vegetable and seed oils, though, so you may not want to use it in recipes like salad dressings where you want the oil to add some flavour. The reason it has a high smoke point is that it is chemically processed, but that doesn’t have much of an effect on its health qualities. Canola oil tends to be highly processed, which means fewer nutrients overall. Cold-pressed or unprocessed canola oil is available, but it can be difficult to find. Canola oil is also often highly-refined, which removes undesirable tastes, smells, or colours. Refined and unrefined oils have the same fatty acid profile. However, cold-pressed or unrefined oils contain more plant chemicals that contribute to their healthfulness. So, might not pack quite as many benefits as your other oil selections, but its versatility should still make it a staple. Canola oil is a versatile and practical cooking oil that’s not very expensive and can be used in a variety of ways, from baking and grilling to stir-frying and making salad dressings. Made from: The seeds of the canola plant, a crossbreed of the rapeseed plant that’s lower in potentially dangerous erucic acid. Best for: light cooking, searing meat, mayonnaise, frying, sauces, stir-fries, roasting, and baking, muffins and light cakes. Not recommended for: Sautéing and salad dressings. Because it has a neutral taste that doesn’t do much for your food in the flavour department, cooks don’t usually recommend using it for sautéing. Pros: This oil has it all: It’s higher in omega-3s than most other plant oils; it’s composed of mostly MUFAs. It has a relatively high smoke point, so it’s more resistant to heat-related breakdown. Thus it’s great for all-around cooking. Cons: Almost all canola grown in North America is genetically modified, so choose organic if you want to avoid GMOs. Note 1: use in all kinds of dishes, not drizzle to your heart’s content, as canola is still high-fat and caloric. You can use this oil to sauté, bake, roast, stir-fry and more. Also, you can cut 1:1 with olive oil when making salad dressings, if you think the olive flavour is nice, but a bit too strong. Note 2: Non-organic canola oil is also usually processed using a chemical solvent called hexane, but the trace amounts of hexane found in the finished product are not a threat to your health. Still, if you really want to avoid it, choose organic (hexane is not allowed in organic production), cold-pressed, or expeller-pressed canola. Other uses: Europe is putting a lot of stock into canola as a biofuel. You’ll also find it in candles, lipsticks, even newspaper ink. Again, “versatility” is the word. 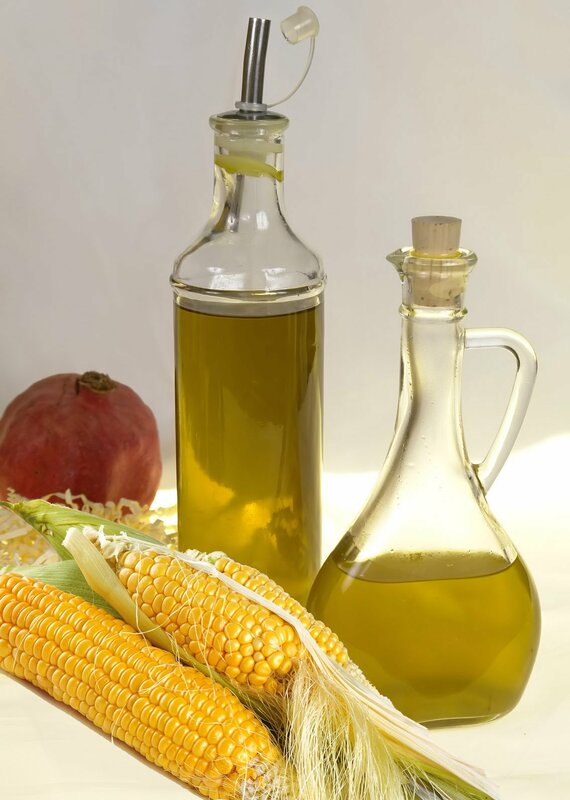 Corn oil is quite a healthy oil because it is composed mainly of polyunsaturated fatty acids and low on saturated fat. It is also used in skin care and hair care, besides many other industrial applications. Corn oil is dark in colour when unrefined. As it gets refined, it turns pale yellow in colour. It has a nutty taste with a hint of corn as well. One can literally feel the taste of corn on the cob in the unrefined, cold pressed oil. However, refined and processed oils lose their aroma and much of the taste as well. Made from the endosperm of corn kernels, corn oil is used in the production of many kinds of margarine. There is a popular misconception that corn is a vegetable. It is actually a grain. Corn originated and was bred from a tall grass-like plant that somewhat resembled wheat. There are various methods of extracting oil from the seed-germs. However, the best oil in terms of health benefits is the cold pressed oil. The oil when extracted is dense and needs to be refined before it is used for cooking purposes. One can also use unrefined oil as it contains more of health-boosting plant phytochemicals. The common process of making corn oil involves expeller pressing. The oil is then treated with a solvent. After that, it is refined which gets rid of free fatty acids. Finally, it is sent through steam distillation to get rid of volatile organic compounds. However, this process leads to a loss of useful compounds and also leads to contamination with the solvent, although very small. A few producers make 100 % pure unrefined corn oil which is extracted using the cold pressed method. This is expensive than other corn oils, but it is natural and organic. Corn oil is very easily available. One can get it any food store. However, one needs to do some searching to find extra virgin corn oil which is cold pressed and unrefined. This one would cost a few bucks more. Made from: extracted from the germ (the small germinating part of the seed) of corn. Best for: It can be used in baking, and because it has a high smoke point it is also good for sautéing, stir and deep frying. Not recommended for: Corn oil makes hair more manageable, although it is not recommended to use it as hair oil. Pros: Its high smoke point. Plus, the most studied property of corn oil is its ability to lower LDL blood cholesterol when taken within limits unless corn oil is taken in such high amounts that its saturated fat content increases cholesterol levels. Corn oil contains Vitamin E which is an antioxidant. Corn oil is good for the health of the cardiovascular system if taken within limits. Like olive oil, it reduces blood pressure post-consumption in hypertensive patients, however, as always, one should keep the consumption of fats within limits, no matter how healthy. Cons: Reduction of LDL cholesterol alone does not mean your heart disease risk is reduced. Also, keep in mind that corn oil has an omega-6 to an omega-3 ratio of 49:1. The optimal ratio is 4:1. Corn oil has 58% omega-6 fatty acids, which, is too high and can lead to inflammation, like arthritis and acne. Therefore, one should make sure to eat enough omega-3 in the diet as well. It is all about balance. You probably also know that almost all corn grown in North America is genetically modified, so the corn oil will be, too (unless you buy organic). 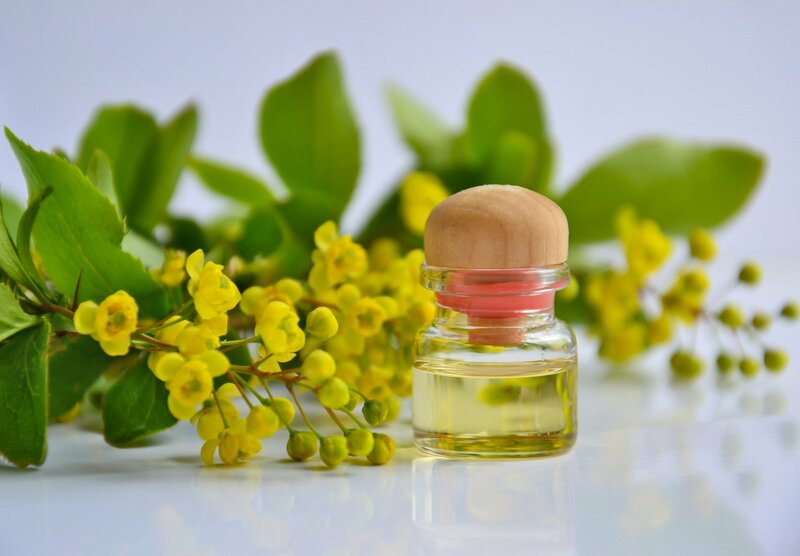 Other uses: It is a nice emollient, though not as good as the well-known massage oils like olive, coconut or sweet almond, corn oil can be used for massage oil, although it is not that popular. It can carry essential oils and as such can be used in aromatherapy massages. It has a mild nutty flavour which should go well with essential oils of nuts. It is a moisturizer for the skin. 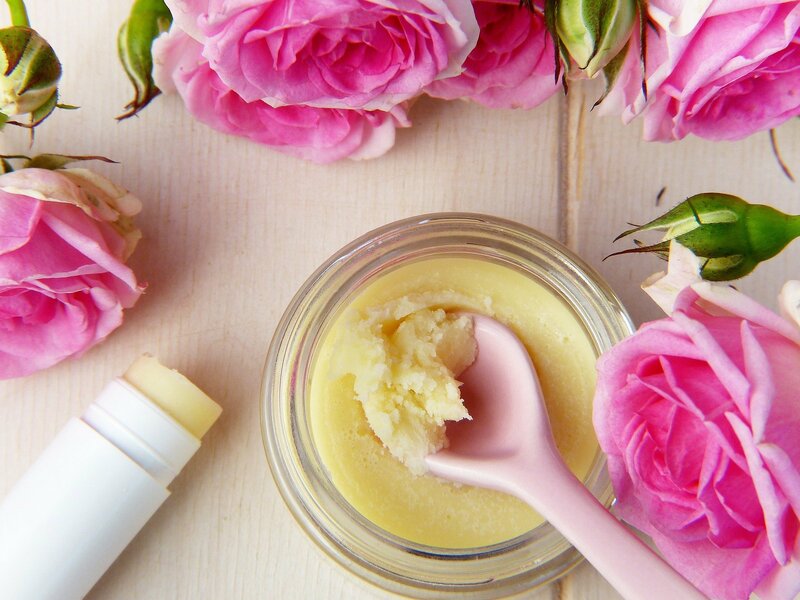 Corn oil is a gentle oil and one can use it as a base oil for household products like lip balms, salves, creams, and night oils. Other common uses also are: Soap making, Carrier for medicines, As an ingredient in insecticides, Preventing corrosion on iron surfaces (rustproofing), Manufacture of nitroglycerin, It is also used in biodiesel technology. Note: Corn oil is generally not toxic if it has been produced using the cold pressed method. If solvents were used to extract the oil, then it can lead to serious adverse health effects in the long run. Corn oil is one of the few vegetable oils that contains trans fats. However, 100 gm of corn oil contains just 0.3 gm of trans fats. Even though trans fats are really bad for cardiovascular health, this amount is pretty small. How to store: This oil needs to be stored in the refrigerator otherwise it turns cloudy. It does not have an impressive shelf life and that only gets worse if it is exposed to light and heat. 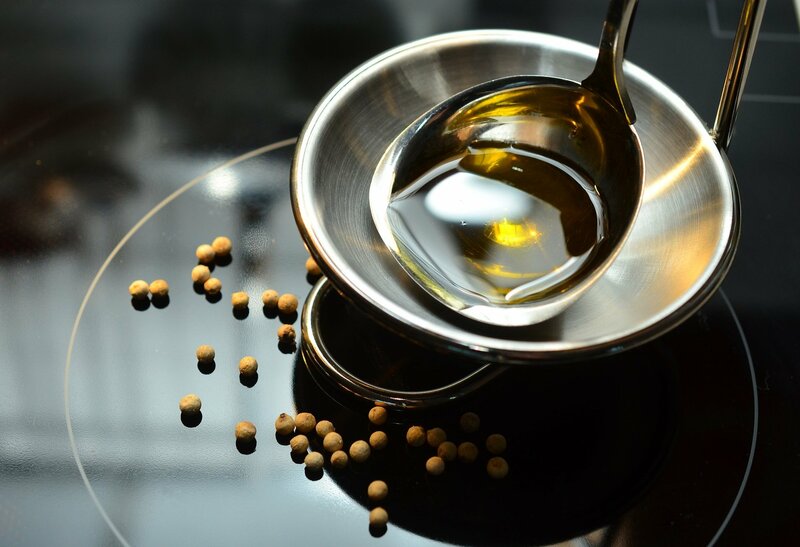 Soybean oil has a neutral taste that blends well with lots of dishes. Soybean oil is often used for frying and for other high-heat methods of cooking. Hydrogenated forms, because they preserve texture and provide a rich mouthfeel, can have a long shelf life, and are a common ingredient in packaged snacks, frozen foods, and condiments like mayonnaise. This oil is also used extensively in the manufacturing of margarine. In addition to healthy polyunsaturated fats and the Vitamin E of other oils, soybean also packs vitamin K, which is important for bone health. But be careful: this is often used in packaged goods with lots of trans fat (the worst kind). Its versatility has made it popular but with high omega-6 content, even though it does contain omega-3 (ALA) you’d better choose something else. Best for: deep-frying, roasting, baking, and general cooking. Not recommended for: Sautéing and salad dressings. Pros: It’s cheap and widely available. Cons: Just about everything else this oil one of the worst. It’s almost always refined, and it’s typically found in processed foods and snack items. Plus, it’s usually genetically modified, and new research shows it may be even more harmful than sugar. Note: In general, there is a lot of controversy surrounding soy, especially when it comes to GMO (genetically modified organisms) sources. So, this particular oil may be best kept off the shopping list unless you are using a non-hydrogenated source clearly labelled as non-GMO. 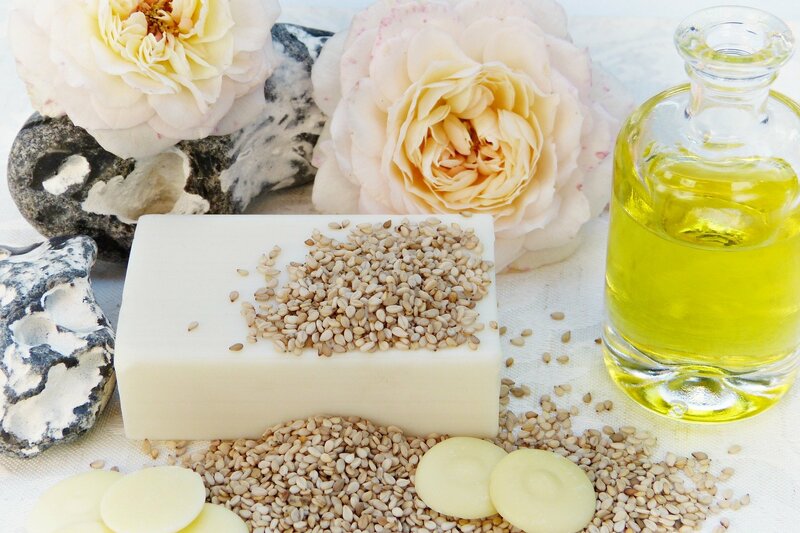 Other uses: You may see soybean oil as an ingredient in skincare and haircare products; the antioxidants protect against free-radical damage related to sources like pollutants and the sun. Interestingly, it may also be used as an insect repellent. The term “vegetable oil” is used to refer to any oil that comes from plant sources, and the healthfulness of a vegetable oil depends on its source and what it’s used for. This inexpensive oil is often a blend of several different oils such as canola, corn, soybean, safflower, palm, cottonseed and sunflower oils in varying proportions. It’s called ‘vegetable’ so that the manufacturers can substitute whatever commodity oil they want without having to print a new label. Widely used for deep frying, this oil is high in saturated fats and has very few health benefits. Still, vegetable oils are refined and processed, which means they not only lack flavour, but also nutrients. Vegetable oil is guaranteed to be highly processed. Vegetable oil is kind of a sister to canola oil. It’s also chemically processed, has a similarly high smoke point (400 to 450 degrees F), and is neutral flavour. Again, these characteristics make it a versatile, all-purpose cooking oil for sautéing, roasting, frying, and baking. Although vegetable oil sounds nice and natural because it seems like it’s made of vegetables, about 99% of the time a bottle of vegetable oil is actually just soybean oil. While vegetable oil blends sometimes contain oils from seeds, like canola or safflower, they’re usually composed largely of soybean. Vegetable oil made from soybeans is a neutral-tasting oil that does not have much flavour. While vegetable oil can be used as an umbrella term for all plant-based oils, as I mentioned earlier, that it can also be used by companies (on ingredient labels) as a generic term for trans fats, which are terrible for you. There’s nothing redeeming about trans fats. They definitely increase cholesterol levels and cause inflammation. And it’s not the healthiest oil ever since the chemical processing depletes the natural mineral content—and that’s why it has that high smoke point. They’re not necessarily bad for you but you can get so much more benefit from olive oil. Processed oils have been pushed past their heat tolerance and have become rancid in the processing. Some of these oils, especially palm, are associated with more degradation of land for production. And I thought vegetable oils were healthy. This versatile cooking oil is an example of recycling as it is extracted from grape seeds left over from winemaking. Grapeseed oil has a high percentage of polyunsaturated fat, with a similar fatty acid profile to soybean oil. I know this one is going to be a big shocker for a lot of people, especially since grapeseed oil is constantly marketed as such a healthy cooking oil. Although the polyunsaturated fat in grapeseed oil may help lower LDL (“bad”) cholesterol, and vitamin E has been shown to fight inflammation, grapeseed oil is about 70% omega-6 fatty acid. Too much omega-6s PUFAs causes inflammation which is the true cause of heart disease and can lead to other health problems like cancer and autoimmune disorders. Oils that are high in omega-6 polyunsaturated fats like grapeseed oil are very fragile and therefore prone to oxidation. When an oil oxidizes it creates free radicals which can also lead to cancer, inflammation, hormonal imbalance and thyroid damage. Even cold pressed grapeseed oil may not be harmed during processing, but it is still high in omega-6s. Some makers of grapeseed oil will go on about how “pure” and wholesome their product is compared to other oils or even other brands of grapeseed oil. That’s probably because most grapeseed oil is industrially processed with hexane and other toxic, carcinogenic solvents used to extract and clean the oil, with traces of these chemicals remaining in the final product. However, expeller-pressed processed grapeseed oil is still rife with polyunsaturated fat, in concentrations which are highly toxic to humans. Doesn’t matter how “pure” those PUFAs are. It is also an industrially processed oil, so it becomes oxidized while it is made. Grapeseed oil is low in saturated fat and has a high smoke point, which makes it a choice for all kinds of cooking and grilling. It is also popular with chefs since it has an extremely high smoke point, and you can use it in frying, sautéing or other high-heat cooking methods. A favourite of chefs and foodies, grapeseed oil is light in colour and flavour, with a mild, slightly nutty taste that works well with a variety of other, stronger flavours. Neutral in flavour, sub it for olive oil in salad dressings, sauces, or condiments like homemade mayonnaise, where you don’t want any flavour because it emulsifies well and won’t separate as easily as other oils might. Its nutty but mild flavour also works well drizzled over roasted veggies. This oil is also used to make margarine. Made from: the seeds of grapes used to make wine. Best for: mayonnaise, dressings, dips and sauces. Not recommended for: It’s not going to kill you if you use a bit of grapeseed oil here and there, but it’s not an oil you should be using all the time as your primary cooking oil. Pros: It has a relatively high smoke point. Cons: It’s another oil high in omega-6 fatty acids with basically no omega-3s. Plus, there’s a small toxicity concern: Grapeseed oil can occasionally have dangerous levels of harmful compounds called polycyclic aromatic hydrocarbons (PAHs*) due to the drying process, which involves direct contact with combustion gases. Whenever possible, buy organic grapeseed oil, as this means it is produced without any chemical substances. * PAHs are not unique to grapeseed oil—you can be exposed to them by eating charred foods, too. Don’t fear grapeseed as a lone source of these compounds. Note1: If using in a salad dressing, stick to about one teaspoon per serving of the dressing—you’ll get the great flavour without going overboard. For frying, pour the oil into a spritzer bottle and spray onto a nonstick skillet to keep calories down. Note2: Most people consume too many omega-6s in the diet (from corn, soy and processed foods) so should work towards lowering them and raising omega-3s (from fish, seafood, flax and chia). Other uses: Mix with other oils to make a massage oil or use as a moisturizer. Use grapeseed oil as a treatment for skin injuries, or use as a lubricant while shaving. 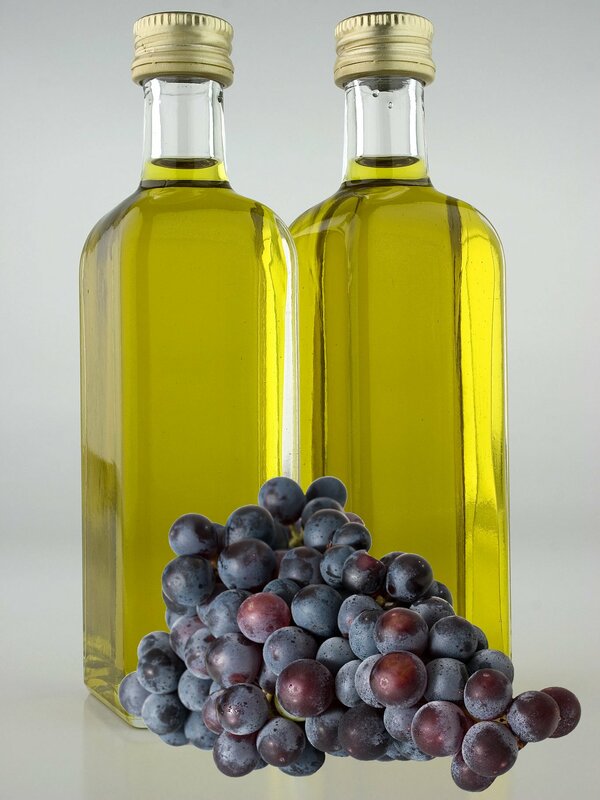 How to store: Store grapeseed oil in the refrigerator to prevent it from becoming rancid. Avocado oil is a great choice. It’s unrefined like extra virgin olive oil, but it has a higher smoking point, which means it can be used to cook at higher heat. 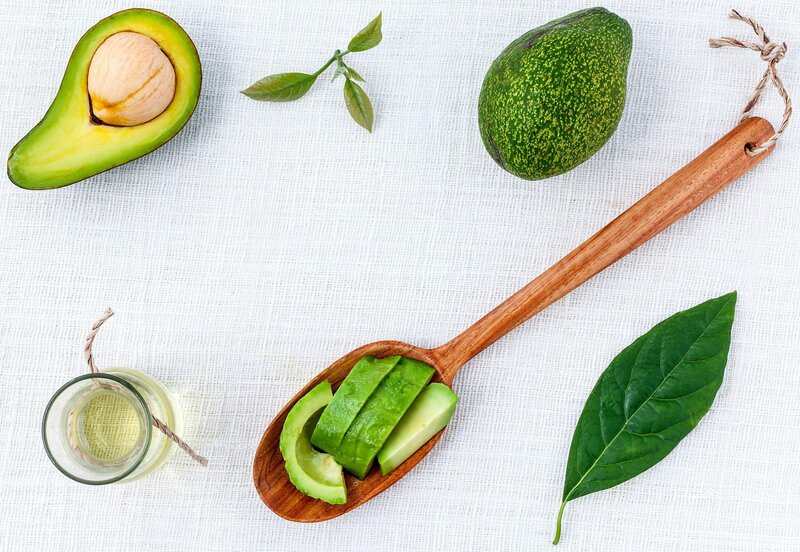 Much of the long array of health benefits to avocados is preserved within avocado oil. Avocado oil has one of the highest monounsaturated fat contents among cooking oils, second only to olive oil. It’s even better for you than olive oil: It’s an anti-inflammatory, Avocado oil is extremely high in oleic acid, which protects against cardiovascular disease and is also linked to reducing LDL cholesterol, triglycerides, and raising HDL cholesterol, healthy joints, cancer prevention, healthy eyes, enhance absorption of some nutrients and better general health. Like olive oil, avocado oil is also low in polyunsaturated fats. Avocado oil contains vitamin E as well and it doesn’t have much saturated fat. It has a neutral flavour without being chemically processed like canola and vegetable oil. It’s just creamy, like an avocado. Avocado oil is a great light oil that stays liquid at room temperature (unlike coconut oil) and doesn’t have a very strong flavour (like olive oil), it has a mild flavour similar to an avocado. Avocado oil also has a high smoke point and is, therefore, one of the best oils for high-temperature cooking. It can be used for grilling, pan roasting, stir-frying, sautéing, grilling,, searing or browning, as well as simply using it cold in salad dressings. One downside is that it tends to be more expensive than those more processed oils and may be harder to find, but if you’re interested in avoiding refined foods, want that high smoke point, and don’t mind the splurge, then this is a great alternative. Made from: It is extracted from the flesh of avocados. Best for: Frying, sautéing, searing or browning, as well as simply using it cold in salad dressings. Not recommended for: Budget cooking. Pros: This is another oil that’s high in MUFAs with a high smoke point, so it’s great for cooking. It’s also loaded with vitamin E, which may help to strengthen our skin and immune system. Cons: It can be really expensive. Note: Make sure you get cold-pressed avocado oil. Cold-pressed avocado oil is less refined than the regular kind and therefore contains more antioxidants. Overall, unrefined oils are more heart-healthy and flavourful. So, choose cold-pressed if you can. Other uses: Avocado oil is completely ideal for hydration, so use it on your skin and hair to moisturize, protect and preserve. While expensive, this oil has immense nutritional value and is safe to be taken in a diet. Walnut oil contains heart-healthy omega-3s in addition to other nutrients. These may help lower lipids, blood pressure and vascular inflammation, all of which support overall health. Walnut oil has a good ratio of omega-6 to omega-3 fatty acids, which helps keep inflammation in check. Common walnut oil has also the following therapeutic properties: Antiseptic (reduces the risk of catching an infection on an open wound), Anti-bacterial, Anti-fungal, Laxative, Analgesic, Antihypertriglyceridemic, Anti-cancer (Walnut oil may have potential anti-cancer properties against a wide range of cancers – These are being evaluated – This can be attributed to the omega-3 fatty acids and other phytonutrients in walnut oil like ellagitannins), Antioxidant, Weight Loss (Walnut oil may have weight loss, similar to green tea). The oil can be obtained via solvent extraction or cold pressing. The cold pressed organic walnut oil is best for health. Another kind of walnut oil is the black walnut oil. Black walnut oil has got its own unique combination of health benefits, which are quite different from the common walnut oil. Black walnut is more of a medicinal herb and its oil also possesses many medicinal properties. This highly fragrant oil made from walnuts is ideal for desserts and other recipes that benefit from a nutty flavour and a light aroma. The rich, nutty flavour works great as a salad dressing and is frequently used in salad dressings in combination with a less flavourful oil, or simply as a flavour enhancer in baked goods, and drizzled over vegetables or fish. There are some types of walnut oils, roasted varieties have a fuller, deeper flavour and should be used only with finished dishes, not heated. Adding a few drops of this oil to bread dough makes the bread carry a walnut smell. One can make a vinaigrette with walnut oil as an ingredient. The demand for walnut oil has decreased in recent time, which has led to lower production. Most of the production today comes from France. Best for: Walnut oil does not stand up to high heat due to its low smoke point. Because of this, stick to drizzles of it on salads or other veggies, over pancakes, freshly cut fruit and ice cream. Not recommended for: its low smoke point means it’s not good for cooking or frying. Pros: It’s one of the few plant oils that will give you a healthy omega-6 to omega-3 ratio. Cons: Its high PUFA content makes it prone to rancidity, and its low smoke point means it’s not great for cooking. Note: Use walnut oil in dishes without heating it. It loses much of its nutritional value and antioxidant power when heated. 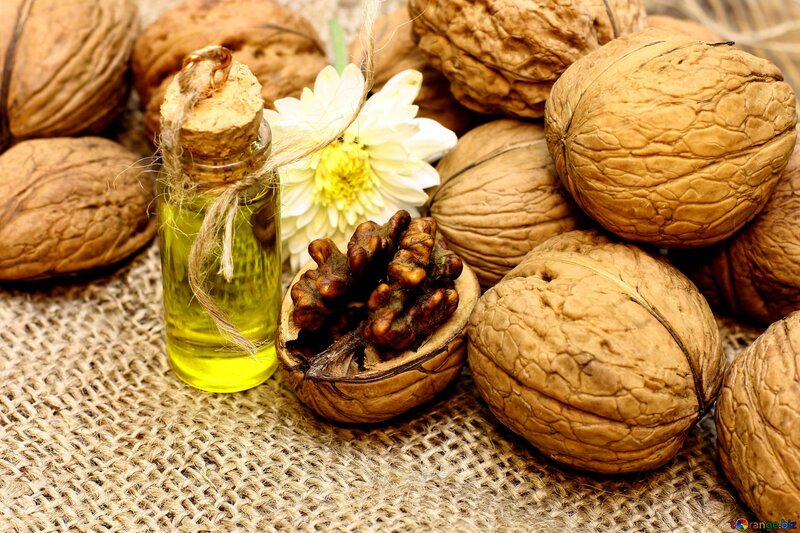 Other uses: Common walnut oil has several properties. Walnut oil makes a nice base oil (carrier oil) for massage and aromatherapy uses. It is used as a cosmetic ingredient in many skin care products (as Anti-ageing, Skin regenerative, Skin toner, Emollient, Relieves fungal infections of skin). It’s also good for hair to make it smooth and glossy. As wood finishing agent, walnut oil polishes wood and makes it look better. You can also make like Renaissance painters, and use walnut oil as paint, paint thinner and brush cleaner. Bitter Almonds – These are almonds that are bitter to taste and are used to produce bitter almond oil. These almonds contain a small amount of hydrogen cyanide, which is extremely poisonous. Do NOT eat Bitter Almonds, eating just a few can lead to vertigo or even death. Sweet Almonds – These are the almonds that we are accustomed to eating. They are used to produce sweet almond oil. This oil also has a sweet taste, making almond oil one of the tastiest oils. Almond oil is reputed for its nutritional quality. It is high in Vitamin E. Rest all vitamins and minerals are in negligible amounts, except for small amounts of Vitamin K. The beneficial properties of Sweet Almond oil makes it so useful in many personal conditions. It provides several health benefits such as anti-inflammatory, anti-oxidant, immune booster, anti-hepatotoxic, anti-colon cancer, emollient, sclerosant, laxative, analgesic, muscle relaxation, cicatrizant, and anti-dandruff. This oil has the flavour of the roasted almonds from which it’s made. The unroasted form is usually labelled “Sweet Almond Oil.” Very light in flavour, without any real nut taste, sweet almond oil is often used by chefs to oil moulds of unbaked desserts. This is also a favourite for baking. It can also be used to sauté or stir-fry oriental foods. Made from: Almond oil is extracted from almonds. Best for: Use it in baked goods, pasta, drizzled over vegetables, or on grilled bread. It has a high smoke point, making it good for stir-frying. Not recommended for: bitter almond oil is extremely poisonous and is hazardous when ingested. 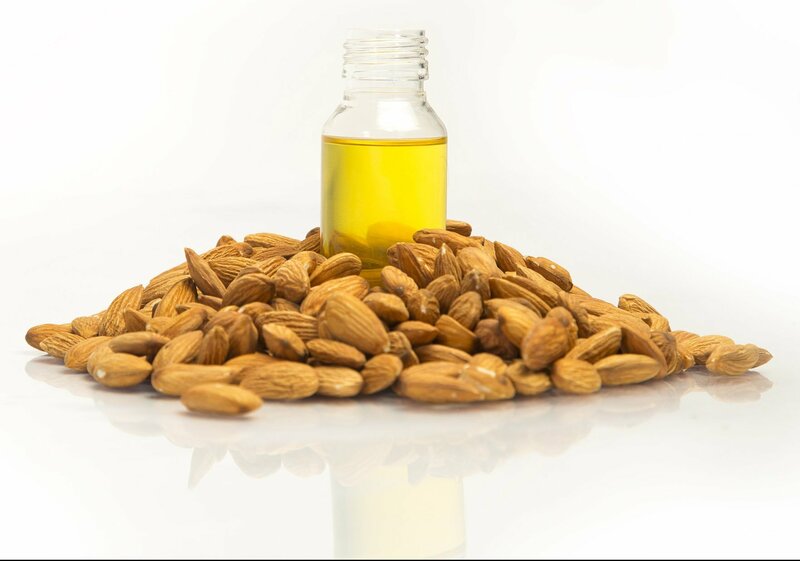 Pros: Besides its uses for skin, hair and the bowel, almond oil in diet can provide significant health benefits. Cons: Eating just a few of these Bitter Almonds can lead to vertigo or even death. Note: In general, the properties of sweet almond oil and bitter almond oil are similar for topical application. For internal use, only sweet almond oil is used, and there is no point in discussing the health benefits of bitter almond oil because it is hazardous when ingested. Other uses: Almond oil is one of the best oils for hair and skin care. It has got lots of nutrients and beneficial properties which make it such a powerful cosmetic ingredient. The results obtained by using almond oil on the skin can be comparable to that of many powerful skin care products, sans all the side effects. It can help one get rid of dark circles in weeks. As well as being delicious, Macadamia oil is packed with nutrients, vitamins, and minerals. Macadamia oil owes its stability mostly to its extremely low omega-6 fatty acid content (the lowest of all traditional cooking oils), high monounsaturated fatty acid content (mostly oleic acid, which is higher than olive oil’s content) which lowers your bad cholesterol and results in less chance of heart disease or stroke, and a decent portion of saturated fat. Macadamia nuts can help improve the blood sugar levels for people with type 2 diabetes, could help you maintain healthy blood pressure, could help you burn fat, could help keep bones strong and sturdy, can help support your gut, may help individuals reduce chronic inflammation and arthritis symptoms. 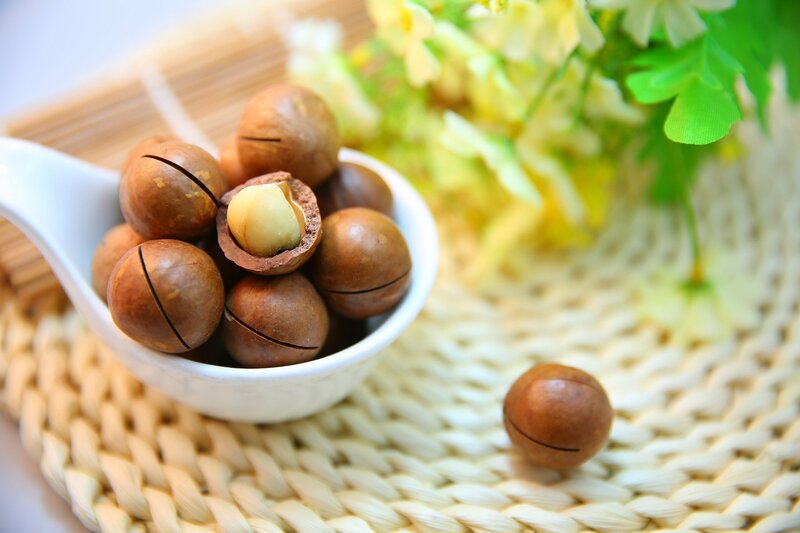 Macadamia oil is also very high in natural antioxidants and contains a good ratio of Omega 3 and Omega 6, which can have a powerful effect on the overall health of the body. Antioxidants fight off free radicals. A healthy balance of antioxidants can reduce cancer risk, slow the ageing process and lessen the risk of vision loss due to cataracts and macular degeneration. Like most nuts, macadamia nuts are a reliable source of fibre and calories. With its light, delicate macadamia flavour, this oil is especially good with fish, chicken, vegetables, for salad dressings, or baked goods, essentially anything you’d normally use olive oil for. Macadamia oil imparts a mild, buttery, rather macadamia flavour to foods, but it’s mild enough to use for homemade mayonnaise. It has a high smoke point and can be used for sautéing or stir-frying. You can also use macadamia oil for personal hygiene (shaving, moisturizing, perhaps even sunblock given the squalene content). Best for: This oil is especially good with fish, chicken, vegetables, for mayo-making, salad dressings, or baked goods, and can be used for sautéing or stir-frying. Not recommended for: Roasted macadamia oil has a fuller, somewhat nuttier flavour than unroasted and should not be heated. Use it as a finishing oil to drizzle over cooked foods. Pros: As well as its natural health benefits, the macadamia nut is the perfect oil to use with food. It has a buttery and delicate quality and is perfect for high heat cooking. The high smoking point, combined with the unique cold-pressed extraction method, means when cooking with macadamia nut oil, you are far less likely to burn off the beneficial fats. Other uses: As well as a food source, their husks can be used for fertiliser, for personal hygiene, the oil is used for a variety of products in the cosmetic industry, and it also can be used as animal feed. The great thing about using macadamia nut oil for your skin is it can be taken internally or topically for great results. How to store: It is highly shelf-stable and resistant to heat-induced oxidation. If you keep your macadamia oil in a dark bottle and in the fridge, or a cool dark place, I bet it’ll stay fresh even longer. You may be surprised to find that some of the worst cooking oils & fats are ones that you may have been told are “healthy”. If you care about your health, make sure you’re not using any of these worst cooking oils & fats. Shortening was once made from animal fat (lard). It has a long history of use in American kitchens that dates back to the early 1900s. Vegetable shortening was developed in the early 1900s as a more economical and nutritional alternative to animal fat. It also provided a vegetable-based fat that vegetarians and people with religious dietary restrictions could use in cooking and baking. Shortening is so called because it gives a “short” texture (as in shortbread). Shortening is a type of fat used in cooking and baking. The term “shortening” technically refers to any type of semisolid fat that is mostly solid at room temperature. This includes butter, margarine and lard. The market term now almost always refers to shortening made from vegetable oils like soybean, cottonseed or refined palm oil, which are naturally liquid at room temperature. However, Vegetable shortening is made through a process called hydrogenation, which transforms liquid vegetable oil into solid vegetable fat by bombarding the oil with hydrogen atoms. This changes the chemical structure of the oil from mostly unsaturated to mostly saturated. This causes the oils to become more solid, creating a thick texture that makes shortening good to use for specific types of cooking and baking. It also allows shortening to be very shelf-stable and stored at room temperature. Until recently, shortening was almost always made of partially hydrogenated vegetable oil. Partially hydrogenated oil contains trans-fats, which have been implicated in causing heart disease. Newer products avoid trans-fats by using a mixture of unhydrogenated oil and fully hydrogenated oil. When oils are fully hydrogenated, they are completely changed from unsaturated fats to saturated fats, so no trans fats are produced. Yet full hydrogenation results in a very hard fat, which no longer has a soft, spreadable texture. Therefore, fully hydrogenated oils are commonly blended with liquid oil in a process called interesterification, which results in a spreadable texture. When an oil is only partially hydrogenated, it is still somewhat soft and has a creamy, spreadable texture. For this reason, the superior texture of partially hydrogenated vegetable oils makes them the ideal shortening. Unfortunately, partial hydrogenation also creates artificial trans fats, which have serious negative health effects. Trans fats raise your risk of heart disease, death from heart disease, heart attack and stroke. They also raise your “bad” cholesterol levels, lower your “good” cholesterol and cause inflammation and the hardening of your arteries. Trans fats can also make it hard for your cells to communicate, impairing the functions of your nervous system and affecting the brain and psychological health. For these reasons, since 2006 the FDA has required all food labels to list the trans-fat content. Consequently, most food companies have reformulated their products to remove all or most trans fats. Most shortenings are now advertised as being trans-fat-free. Still, check the label. If hydrogenated or partially hydrogenated oil is listed first, the product may contain more trans fats than you want. To find out if your shortening contains trans fats, read the ingredients list. If it contains “partially” hydrogenated vegetable oil, then it contains trans fats too. Most of the new shortenings are free of trans fats, and they are made with a combination of fully hydrogenated palm oil and soybean oil. The lack of trans fats in newer recipes means that these shortenings do not carry the same health risks as traditional shortening that does contain trans fats. However, the health effects of interesterified fats are still largely unknown. There simply has not been enough research yet to know how these fats affect the heart and metabolic health in the long term. A few studies in rats have found that high levels of interesterified fats have negative effects on blood lipids. However, these effects have not been seen when these fats are eaten in more normal amounts. While shortening does supply the essential vitamin E and vitamin K, and heart-healthy unsaturated fats, it doesn’t supply anything in the way of other essential nutrients such as protein, fibre, iron or vitamin C. Just 1 tablespoon of vegetable shortening can be a significant amount over the limit of saturated fat. Even more dangerous is the trans fat it contains. Aim to completely eliminate trans fats from your diet because they raise bad cholesterol levels, lower good cholesterol levels and increase your risk of heart disease. Shortening has a higher smoke point than butter and margarine (it is less flammable), leading to its use in deep-fat frying and as a pan coating to prevent baked goods from sticking and is 100 % fat (compared to butter and margarine that contain milk solids). The fat content of vegetable shortening makes it useful for frying and for recipes that require pure fat. Therefore, it is very high in calories, offers no nutritional benefits, and contains neither carbs nor protein. It is more economical than butter or lard; as it can be stored at room temperature it does not require refrigeration (it may last up to one year in an airtight container), and can extend the shelf life of some foods and baked goods. Some vegetable shortening contains tiny bubbles filled with nitrogen. These bubbles are useful in recipes that require leavening. These vegetable shortenings may also contain emulsifiers that help stabilize the gas-filled bubbles and disperse the fat. Because of shortening’s unique characteristics, it’s often used in baking. Vegetable shortening adds a flaky texture to foods such as pie crust and pastry shells. Nevertheless, some people prefer butter because it has a richer flavour and produces a chewier, crispier product. Therefore, which fat is superior for baking really depends on the texture and taste you prefer. Firm fats produce flaky pastry; oils yield more compact pastry. The proportion of shortening in doughs and batters varies according to the product, with bread and rolls containing about 1–2%, cakes containing 10–20%, and piecrusts containing over 30%. Increasing shortening proportions increases tenderness, but very high proportions may cause cakes to fall. When vegetable shortening is used in cookies instead of butter, the cookies may have a fluffy texture but lack flavour. If half butter and half vegetable shortening are used, both texture and flavour may improve. If butter must be excluded for religious or dietary reasons, butter flavouring or ground nuts could be added to the batter for their rich flavour and for the granular texture of nuts. In addition to limiting your intake of foods that contain shortening, you can also replace shortening with other alternatives in recipes. Butter is probably the most popular alternative to shortening. Many people actually prefer butter because of the rich flavour it adds. Some people are hesitant to use butter because it is naturally high in saturated fat, containing about twice as much as shortening. In the past, health experts have claimed that eating saturated fat is linked to a higher risk of heart disease. Therefore, butter is a suitable alternative to shortening in most recipes. Just be aware that the water in butter may create a slightly different texture than shortening would. Clarified butter, which contains very little water, is also a good alternative. Palm or Coconut Oil Shortenings – Coconut and unrefined palm oil are naturally high in saturated fat, which makes them solid at room temperature. This solid, spreadable texture means they are easy replacements for shortening. Many brands now sell alternative shortenings made from pure palm or coconut oil, which can replace shortening at a 1:1 ratio. But these options are not without drawbacks. 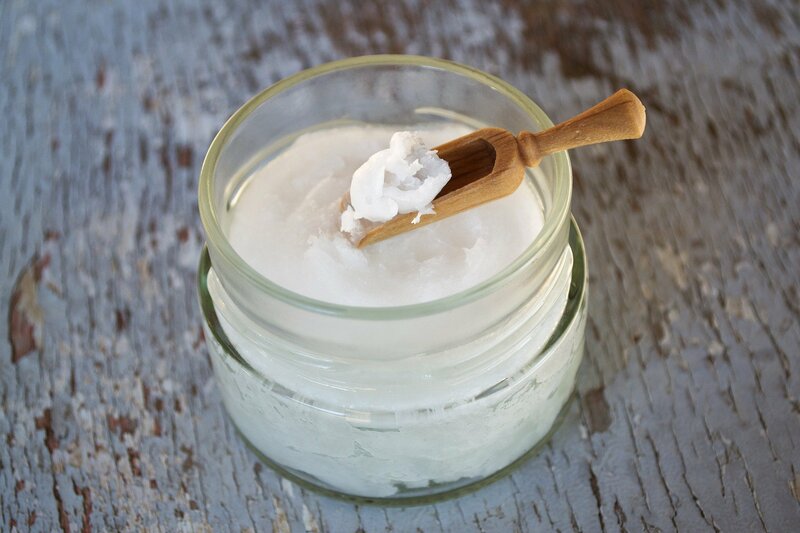 Coconut oil may give foods a nutty or coconut flavour. And palm oil has come under fire because harvesting it has negative effects on the environment. Other Plant Oils – Most plant oils are high in monounsaturated and polyunsaturated fats, which causes them to be liquid at room temperature. So they are only a good choice for recipes that call for melted shortening. Some evidence shows that replacing saturated fat in the diet with unsaturated fat can reduce your risk of heart disease. However, some types of plant oils are also rich in omega-6 fatty acids, which most people already consume far too much of. Additionally, it’s important to make sure that the cooking temperature does not exceed the smoke point of the oil you use. Some plant oils are good choices for cooking, while others are not. Check out “Different Types of Cooking Oils – Choose Wisely” for more information on which oils are the best for cooking. Made from: Shortening can be made from either animal fat or vegetable oil, but shortening made from partially or fully hydrogenated vegetable oil is more common nowadays. 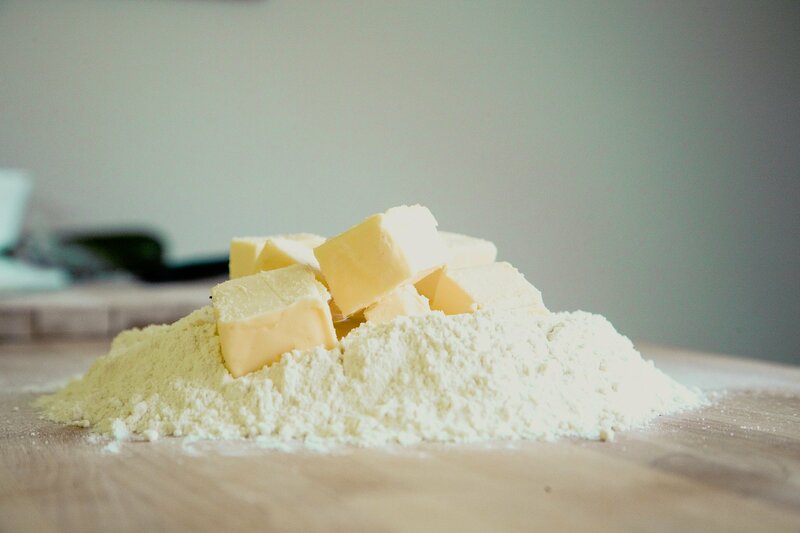 Best for: Shortening is traditionally used in pastries such as cookies, pie crusts, cakes or frosting. Not recommended for: It’s a good idea to limit your intake of shortening and use healthier alternatives when possible. Shortening can be replaced with alternatives like butter, coconut oil, palm oil or other healthy plant oils. Pros: Shortening is used in baking to give pastries a tender texture. Many people use shortening because it’s cheaper, higher in fat and more stable than other types of fat. Cons: Unlike some other types of fat, shortening contains 100% fat. Therefore, it is very high in calories and low in nutrients. Shortening is still highly processed and is typically only used to make fried foods or pastries that are high in added fat and sugar. Shortening was traditionally made with partially hydrogenated vegetable oil. Partial hydrogenation creates a smooth, spreadable texture, but also produces harmful trans fats. Note: Most types of shortening have been reformulated to be trans-fat-free. However, shortening is still highly processed and the health effects of the new methods are still unknown. Therefore, while it’s okay to enjoy the occasional treat, it is a good idea to limit your use of shortening overall. Margarine is an emulsion containing about 80% fat, from either animal or vegetable sources, plus water, salt, emulsifiers, and sometimes milk solids. They are white to yellow in colour, with neutral or butterlike flavour and solid consistency. Margarine has a high melting point, produces tender products, and is especially popular for use in puff pastes. Margarine is used for spreads and in cooking. Nutritionally, margarine is primarily a source of calories. None of the major brands has any dietary cholesterol since almost all is made from vegetable oils. When shopping for margarine or spread, there are some pointers on how to choose one with “better” ingredients. Most margarine products have labels telling how much saturated and polyunsaturated fat they contain. Look for a product with at least twice as much polyunsaturated as saturated fat. If a brand doesn’t give you a breakdown of fats, be suspicious. Although all the oils commonly used in margarine are high in polyunsaturated fat and low in saturated fat, they vary substantially. Be wary of sodium content, which tends to be relatively high. Some margarine, are mostly a mix of canola and soybean oils. Soybean oil is too high in omega-6 fatty acids which can lead to inflammation and other diseases. Canola oil is highly processed and treated with chemical deodorizers and solvents. On top of that, some brands also include safflower, sunflower, corn oil which are also notoriously high in omega-6 fatty acids. Vegetable fats can contain anything from 7% to 86% saturated fatty acids. Liquid oils (canola oil, sunflower oil) tend to be on the low end, while tropical oils (coconut oil, palm oil) and fully hardened (hydrogenated) oils are at the high end of the scale. A margarine blend is a mixture of both types of components. Generally, firmer margarine contains more saturated fat. There are two types of unsaturated oils: mono- and poly-unsaturated fats, both of which are recognized as beneficial to health in contrast to saturated fats. As in butter, 100 % of margarine’s calories come from fat, but the fat is largely polyunsaturated. Some widely grown vegetable oils, such as rapeseed (and its variant canola), sunflower, safflower, and olive oils contain high amounts of unsaturated fats. Typical soft tub margarine contains 10% to 20% of saturated fat. Regular butterfat contains 52 to 65% saturated fats. It is recommended saturated fat intake to be as low as possible. Omega-3 fatty acids are mostly obtained from oily fish caught in high-latitude waters. They are comparatively uncommon in vegetable sources, including margarine. However, one type of omega-3 fatty acid, alpha-linolenic acid (ALA) can be found in some vegetable oils. Flaxseed oil contains 30-50% of ALA, and is becoming a popular dietary supplement to rival fish oils; both are often added to premium margarine. An ancient oil plant, Camelina sativa, has recently gained popularity because of its high omega-3 content (30-45%), and it has been added to some kinds of margarine. Hemp oil contains about 20% ALA. Small amounts of ALA are found in vegetable oils such as soybean oil (7%), rapeseed oil (7%) and wheat germ oil (5%). Omega-6 fatty acids are also important for health. They include the essential fatty acid linoleic acid (LA), which is abundant in vegetable oils grown in temperate climates. Some, such as hemp (60%) and the common margarine oils corn (60%), cottonseed (50%) and sunflower (50%), have large amounts, but most temperate oilseeds have over 10% LA. Margarine is very high in omega-6 fatty acids. The omega-6 to omega-3 ratio is typically 5:1 to 10:1. Large amounts of omega-6 decrease the effect of omega-3. Therefore, it is recommended that the ratio in the diet should be less than 4:1, although the optimal ratio may be closer to 1:1. During the manufacture of margarine, makers may convert some unsaturated fat into hydrogenated fats or trans fats to give them a higher melting point so they stay solid at room temperatures. Unlike essential fatty acids, trans fatty acids are not essential and provide no known benefit to human health besides providing calories. Several large studies have indicated a link between consumption of high amounts of trans fat and coronary heart disease, and possibly some other diseases, prompting a number of government health agencies across the world to recommend that the intake of trans fats be minimized. For a long time, margarine was a danger because it was high in trans fat which contributes to heart disease. However, nowadays people are wise to the dangers of trans fats, so most margarine does not contain trans fats because they are associated with increased risk of heart attack and stroke, but it’s still not a good choice for consumption. Still, check the label. If a hydrogenated or partially hydrogenated oil is listed first, the product may contain more trans fats than you want. Replacing saturated and trans unsaturated fats with unhydrogenated monounsaturated and polyunsaturated fats is more effective in preventing coronary heart disease than reducing overall fat intake. Margarine is rich in vitamin E. Unless fortified with micronutrients during manufacturing, there are no other nutrients in significant content. Vitamin A and vitamin D may be added for fortification. The roles of butter and traditional margarine (80% fat) are similar with respect to their energy content, but low-fat margarine and spreads are also widely available. Vegetable-oil spreads contain less than the 80 % fat by weight required in margarine, but this does not necessarily add up to them being more healthful than regular margarine. Diet or reduced-calorie margarine though all of its calories still come from fat (about 45 % fat by weight), it is diluted with water, so it has half the fat and calories of regular margarine per tablespoon. It is not, however, suitable for cooking. Butter-margarine blends are anywhere from 15 to 40 % butter. Thus they contain some of the butter’s saturated fat, as well as its taste. Cholesterol-lowering spreads are brands of margarine that can actually lower total blood cholesterol by an average of 10 % when eaten in sufficient quantities daily. They are stated to lower LDL (“bad”) cholesterol levels without adversely affecting HDL (“good”) cholesterol levels. These cholesterol-lowering spreads are intended to be taken in daily doses (each of them is slightly different) in order to have a beneficial effect. Lard is made from hogs fat, has solid consistency, white colour, about 98% fat content, and mild, pleasing flavour and odour considered desirable in bread, crackers, cookies (sweet biscuits), and pie-crusts. Nutritionally speaking, lard has nearly one-fourth the saturated fat and more than twice the monounsaturated fat as butter. It is also low in omega-6 fatty acids, known to promote inflammation; according to lard enthusiasts free-range pigs that eat greens, not grains, have higher levels of omega-3 fatty acids. Because lard contains more saturated fat than veggie oils, it doesn’t go rancid as quickly. Lard is lower in saturated fat than other animal fats, it contains about 40% saturated fat as opposed to butter’s 60%, and higher in heart-healthy monounsaturated fat—the type that gives olive oil its health halo. Lard is made up of 45% monounsaturated fat — compare that to only 32% in butter and 6% in coconut oil. Plus, in its natural form, lard has none of the trans fats that we know are bad for you. Making lard one of the best of the well-known solid fats. With all these benefits, are there any cons to consuming lard? Some experts still believe it’s important to watch your saturated fat intake, as dairy and meat, even from pasture-raised animals, contain cholesterol. Getting more than 7% of your calories from saturated fat increases the risk for high cholesterol and heart disease, even though more recent research suggests this is not the case. Experts go back and forth on lard. Health-wise, it’s no olive oil, but when you cook with lard, you get the bonus of adding extra Vitamin D to your diet, which no other fat except butter can claim (and it contains a lot more Vitamin D than butter). A tablespoon of lard from a pasture-raised pig has about 1,000 IU of vitamin D. By comparison, 1 tablespoon of butter has 9 IU of vitamin D, while the same amount of olive oil has none. In fact, lard is one of the highest dietary sources of vitamin D.
Lard does not last quite as long as shortening does. Refrigeration will help. Refrigeration is a good idea anyway because the pastry-like foods commonly made with lard will turn out best if everything (ingredients, rolling pin, work surface, bowls, etc.) is kept cold until baking. Lard also just makes things taste better—there’s a reason your grandma used it in everything from pies to scrambled eggs. Just don’t fill up your deep fryer. Lard has a low smoke point. It’s a higher smoke point than olive oil or butter, but lower than veggie or safflower oil. But it can handle a 400-degree oven, and you can toss it in a sauté pan instead of butter to fry eggs or sauté veggies. And it’s tasty—really tasty. Its smoky, unctuous flavour is the secret ingredient in some of the best pie crusts and baked goods, and it can be used to baste chickens at the end of cooking to get a crackly skin, and confit chickens or ducks. It also has the reputation of producing ultra-flaky pastry crust. Lard is sometimes used in biscuits and pie dough, as it is very rich and makes an extremely tender, flaky crust. Lard is particularly important for traditional pie crusts, such as the one for apple pie. Substitution is not advised. Lard also can be used in roast potatoes. There’s no comparison in cooking beans with lard and cooking them with oil. Larding is the process by which lardons (bits of lard) are injected into meat. This is sometimes done before cooking a tough piece of meat. Fatback lard is created by grinding and heating the skin and subcutaneous fat from, primary the back and sides of a hog. A process known as rendering. Leaf lard is rendered from fat taken from abdomen and kidney region. Leaf lard is used especially in baking. Leaf lard is the firmest, least flavourful, and least aromatic of any rendered hog fats. The best lard considered to be minimally processed. A product simply called “lard” is any fat rendered from a hog. Cans of lard are available in grocery stores, but most of these products have been hydrogenated so they’ll last longer and are probably not what you want. Bacon grease is lard. Same goes for fatty bacon, pork shoulders, and pork butts. Store-bought lard from the grocery store can’t compete with high-quality lard from a butcher. That aside, if you’re ready to add lard to your diet, there’s an important caveat to its health benefits: Lard that’s sold solid at room temperature and doesn’t need to be refrigerated does contain trans-fat and likely less of the good-for-you vitamin D. Plus, it’s not nearly as good for cooking, commercial lard is “like poison”. Instead, consider making your own lard, which is very easy to make. Ask your butcher for back fat or leaf lard or getting a pasture-raised, organic cut of pork like bacon or pork belly and rendering it at home, which is as simple as slicing off the fat, cutting it up, and cooking it low and slow on the stove or in your oven. If you’ve been slow-cooking a pork shoulder (preferably with some cuts in the fat tissue to let the lard drain out) for a while or sizzling away bacon, the fat that has rendered in the bottom of the pan is lard. If the drippings are allowed to sit in a tall glass container, lard will float to the top. One tip: pour that fat through a very fine strainer to remove any burned, black flecks. Those burned bits can turn your lard. Be sure to allow enough time for the non-lard content to settle out; reheating may be required. Once settled, the lard must be refrigerated. Store in tightly sealed container in the fridge or freezer, and it can keep for months. Home-made lard can have a bit of a roast pork flavour, which is very good for making beans. Made from: any part of the pig where there is a high proportion of adipose tissue. Best for: can be used in everything from pies to scrambled eggs. You can toss it in a sauté pan to fry eggs or sauté veggies. It can be used to baste chickens at the end of cooking to get a crackly skin, and confit chickens or ducks. Lard is also used in biscuits and pie dough, as it is very rich and makes an extremely tender, ultra-flaky pastry crust. Lard also can be used in roast potatoes, and in cooking beans with it. Not recommended for: Don’t fill up your deep fryer. Lard has a low smoke point. Pros: Lard one of the best of the well-known solid fats. It is high in heart-healthy monounsaturated fat and it boasts a punch of Vitamin D.
Cons: Lard is high in Saturated Fats. Note: The best way to use it, as is true of most fats, is to use it in moderation! How to store: Lard does not last quite as long as shortening does. Refrigeration will help. Ghee also known as Ghrita, is a class of clarified butter that originated in India. It is commonly used in Middle Eastern cuisine, cuisine of the Indian subcontinent, Southeast Asian cuisine, traditional medicine, and religious rituals. Ghee is made by slowly melting regular butter. The butter separates into liquid fats and milk solids. Once separated, the milk solids are removed, which means that ghee has less lactose than butter. The resulting ghee has a rich, nutty flavour, almost like popcorn butter. Butter is made up of three components: fat, water, and milk solids, which house the proteins. Ghee is the butter without the milk solids. It’s simply the fat and water. It’s more concentrated in fat than butter because its water and milk solids have been removed. Butter = yellow, milk solids = white. If you were to make clarified butter, you’d simply skim/strain off the white milk solids from the top. For ghee, keep heating the butter until the milk solids brown and sink to the bottom. Once they’ve sunk, strain the liquid through a cheesecloth. The remaining golden liquid is your ghee. It keeps much longer than butter, has a high smoke point, and you can cook pretty much anything with it (like searing meats or sauteing veggies). Ghee and clarified butter are similar cook-wise, but ghee adds a rich, nutty flavour. This makes your pancakes char-free and exceptionally tasty. Because ghee and butter both derive from cow’s milk, their nutritional profiles and fat content are very similar. However, because ghee does not contain the same levels of dairy proteins as butter, it may be better for people who do not tolerate dairy products well. One of the best ghee benefits is that it’s free of lactose and casein protein. Some individuals have a milk allergy, which may stem from a heightened sensitivity to casein, and others may be hypersensitive to lactose. For individuals with a casein allergy, the reaction may include swelling of lips, mouth, tongue, face or throat; hives; or congestion. Those with lactose intolerance have a difficult time digesting the milk sugar lactose, but symptoms are generally much less dangerous than a casein allergy. Symptoms of lactose intolerance may include bloating, flatulence, nausea, vomiting, gurgling and cramps. The majority of people who have sensitivities to either casein or lactose don’t have an issue with ghee, as these elements have been removed through skimming and straining. Often, those with dairy sensitivities can tolerate ghee (consult a doctor if you have a severe allergy). Various research studies have looked at the possible benefits and risks of heart disease of including ghee in a person’s diet. According to researches, ghee contains more than 60% saturated fat, which has led to concerns that ghee might increase the risk of coronary artery disease(CAD) in India. However, other studies in north India suggests that the fat and cholesterol in the blood was healthier in the people who ate more ghee and less mustard oil as sources of fat in their diets. Results included lower LDL or bad cholesterol levels and higher HDL or good cholesterol levels. This study only compared results between ghee and mustard oil and not butter. Some forms of mustard oil are banned for consumption in the United States, Canada, and Europe because they contain erucic acid. Ghee is full of fat-soluble vitamins and healthy fatty acids, and ghee benefits can range from building stronger bones to enhancing weight loss. Ghee is rich in the fat-soluble vitamins A, D, E, and K2 which can help balance hormones. It is also rich in CLA (conjugated linoleic acid) — the essential fatty acid found almost exclusively in grass-fed animals which is now believed to protect against cancer, heart disease, and type II diabetes. Others have found that it supports digestion, has shown promising results as potential food for decreasing risk of cardiovascular disease and can help with weight management. Vitamin K is essential to many aspects of health, such as blood clotting, heart health and brain function. It’s also incredibly important when it comes to keeping your bones healthy and strong. This is because vitamin K is directly involved in bone metabolism and increases the amount of a specific protein that is required to maintain the calcium in your bones. Ghee supplies a small amount of vitamin K but can make a big difference when combined with an overall healthy diet and lifestyle. Adding a few servings of ghee into your day is an excellent way to squeeze in some extra fat-soluble vitamins. Ghee can help boost your intake of vitamin A, vitamin E and vitamin K, all important nutrients that play a role in everything from maintaining healthy vision to keeping your skin glowing. Ghee is jam-packed with conjugated linoleic acid (CLA), a fatty acid associated with a long list of health benefits. Some studies have found that CLA may be effective in reducing body fat, preventing cancer formation, alleviating inflammation and even lowering blood pressure.) Keep in mind that grass-fed dairy provides a higher concentration of this important fatty acid. Opt for grass-fed ghee whenever possible, or be sure to use grass-fed butter if you’re making ghee at home. Ghee contains a fatty acid called Butyrate, or butyrate acid, which plays an essential role in digestive health. Some studies have suggested that it may help support healthy insulin levels, and provide relief for individuals suffering from conditions like Crohn’s disease and ulcerative colitis. It may also have anti-inflammatory effects like arthritis, inflammatory bowel disease, Alzheimer’s, diabetes and even certain types of cancer. However, this important fatty acid is also made by the gut flora when you eat fibre, a person does not need to consume saturated fat to obtain this. Additionally, some studies have suggested that butyrate may provide relief from constipation. A review out of Poland, for example, noted that butyric acid has been shown to reduce pain during defecation and improve peristalsis, or the contraction of muscles in the intestines, to help propel food through the digestive tract. All in all, while you shouldn’t go chugging the stuff, it could be a good thing to incorporate into your diet, especially to replace butter or other cooking oils. The smoke point is the temperature at which an oil begins to burn and smoke. Not only does heating a cooking fat above its smoke point put it at a greater risk of hitting its flash point and causing a fire, but it also breaks down important phytonutrients and causes the fat to oxidize and form harmful free radicals. Ghee is an excellent choice for cooking because of its high smoke point and beneficial effects on health. The smoke point of ghee is 251°C (485°F), which is much higher than the smoke point of butter at 176°C (350°F). This means that you can easily use ghee for baking, sautéing, frying and roasting without the risk of destroying the important nutrients that it contains that provide all these wonderful ghee benefits. It has a Strong, Buttery Flavour – By removing the milk solids and water from butter, ghee is left with a stronger, more intense flavour than regular butter. Its taste is also often described as nuttier, richer and deeper than butter. When you’re cooking with ghee, you may find that you’ll need even less to get that same satisfying, buttery flavour. Ghee is generally used in Indian and Southeast Asian cooking for curries, dals, sautéing and for flavouring desserts. Treat ghee like any other cooking oil. Roast meat with it, stir-frying, saute vegetables, melt it over steamed vegetables, cook pancakes. Ghee can be used as a substitute for butter, and many people think that ghee might be a more healthful alternative for using in cooking. Use ghee for any cooking in a skillet like stir-fries, scrambled eggs, sauteed veggies, etc. Really just use it to cook however you like – you won’t have to worry about burntness – or add it onto bread, toast, crackers, muffins, waffles, popcorn, sandwiches, or other baked goods to replace butter. The possibilities are endless. You can also make your own ghee from butter. A person can make ghee at home using regular unsalted butter. Melt the butter slowly and skim off the solids that gather on the surface. Continue to cook the butter until all the milk solids have sunk to the bottom and the liquid is clear — this is clarified butter. Continue to cook for a few more minutes until the milk solids at the bottom of the pan turn brown. The cooked milk solids give the ghee its flavour and colour. Sieve the liquid into a jar or bottle and let it cool and solidify. Studies have found that ghee may improve some heart health markers. However, make sure to choose dairy ghee and not vegetable ghee. Ghee is made from butter and is not vegan. If you’re following a vegan diet, it’s best to stick to other healthy dairy-free fats. In moderation, ghee can be an incredibly healthy dietary addition. However, it is possible to overdo it, and eating too much can actually have a negative impact on your health. Like any type of fat, if eaten in excess, ghee disadvantages can range from diarrhoea to indigestion. Long-term, an extremely high-fat diet may also result in issues like weight gain and heart disease. Additionally, some studies have found that the cholesterol in ghee may oxidize when exposed to high heat. The oxidation of cholesterol is linked to several adverse health effects, including heart disease and even cancer. However, if enjoyed in moderate amounts, most research indicates that ghee can make a nutritious addition to the diet. For best results, pair it with a balanced diet and other heart-healthy fats, like olive oil. Potential adverse effects of ghee include an increase in LDL cholesterol levels and the formation of oxidized cholesterol during its production. Since the milk solids have been removed, ghee is shelf-stable at room temperature (after all, there wasn’t refrigeration for most of our history). You can keep ghee in the pantry and it should stay good for months, unless you introduce extra moisture or ingredients – for example, spreading jam on your gluten-free toast and then dipping the same knife into the ghee, or swallowing a spoonful and then going back for more with the same spoon. If you use ghee sparingly and won’t get through it in a few months to a year, or don’t want to worry about ‘double-dipping’, you can store your ghee in the fridge. It will firm up in cooler temperatures but will soften if you take it out of the fridge a half an hour or so before you want to enjoy it. It provides certain cooking advantages over butter and is definitely preferable if you have a dairy allergy or intolerance. However, at this point, there isn’t any evidence suggesting that it’s healthier than butter overall. Both can be enjoyed in moderation as part of a healthy diet. Made from: Ghee is made by heating butter to remove the milk solids and water. However, it is heated longer than clarified butter to bring out the butter’s inherent nutty flavour. LIke regular butter, it is usually made from cow’s milk. Best for: Incredibly versatile and easy to use, ghee can replace other fats in your diet and can be used for roasting, sautéing or baking a variety of dishes. Not recommended for: Ghee may be better for high-temperature cooking, but butter has a sweeter, creamier taste that may be more suitable for baking and cooking at lower temperatures. Pros: It has a high smoke point, is free of lactose and casein, and is high in beneficial compounds like CLA and butyrate. It also contains several fat-soluble vitamins, including vitamins A, E and K. Ghee benefits include improving digestion, reducing inflammation, promoting weight loss and strengthening the bones. Compared to butter, it has a higher smoke point, more intense flavour, and a greater amount of short- and medium-chain fatty acids — not to mention a host of ghee benefits. Cons: Eating too much can have a negative impact on your health, like weight gain, diarrhoea, indigestion and heart disease. Additionally, some studies have found that the cholesterol in ghee may oxidize when exposed to high heat. The oxidation of cholesterol is linked to several adverse health effects, including heart disease and even cancer. Note: While ghee should be limited, a person can occasionally include it in a varied and balanced diet. Other uses: Use ghee in natural beauty care recipes. Ghee is still used in Ayurvedic massage and as a base for herbal ointments to treat burns and rashes. How to store: Because its milk solids have been removed, it does not require refrigeration and can be kept at room temperature for several weeks. In fact, like coconut oil, it may become solid when kept at cold temperatures. Where to buy: ghee is widely available at most grocery stores and health shops and can typically be found in the ethnic food section or next to other oils, such as coconut oil. You can also easily purchase ghee online from many major retailers or even try your hand at making ghee at home. Be sure to look for grass-fed, organic ghee whenever possible. You can buy ghee, just as you can buy clarified butter, but if you’ve got some butter on hand and about ten minutes of free time, there’s really no need to. Made by churning cream until it reaches a solid state, butter comes in sweet (unsalted) and lightly salted varieties as well as whipped and reduced-calorie versions. Whipped butter, which is packed in tubs and comes sweet and lightly salted, has had air or nitrogen gas beaten into it, making it soft and easy to spread at refrigeration temperatures. Reduced-calorie butter, with about half the calories of regular butter, has—in addition to cream—water, fat-free milk, and gelatin. Butter has long been used as a spread and as a cooking fat. It is an important edible fat in northern Europe, North America, and other places where cattle are the primary dairy animals. In all, about a third of the world’s milk production is devoted to making butter. It is solid but soft at room temperature and melts easily. Its colour is generally pale yellow but can vary from deep yellow to nearly white depending largely on what type of food the animals were eating. (Butter is typically paler in the winter, for example, when dairy cattle feed on stored hay rather than fresh grass). In the United States, vegetable colour can be added to commercial butter in order to improve yellowness. Real butter does not contain any trans fats. However, it does contain high levels of saturated fat, which can contribute to high blood cholesterol levels and heart disease if not eaten in moderation. However, fats are essential for a healthful diet, a person should limit their intake of saturated fats and increase their intake of monounsaturated and polyunsaturated fats, which are healthful fats. It is recommended that a person should get no more than 5 to 6% of their total daily calories from saturated fat, which is about 13 grams per day. Good sources of healthful fats include fish, nuts, seeds, and olives. Butter contains more than just saturated fat. People are often surprised to learn that about a third of the fat in butter is actually monounsaturated—the same sort of heart-healthy fat that’s in olive oil and avocado. The same or similar is true of most animal foods, by the way. Although we tend to think of meat, eggs, and dairy products as containing mostly or only saturated fat, this is not the case. Up to half of the fat in beef is monounsaturated. Two-thirds of the fat in an egg is unsaturated. Ironically, the only foods I can think of that contain virtually all saturated fat is plant-based: coconut and palm oil. It is recommended that anyone who is aiming to lower their LDL cholesterol should get no more than 5–6% of their total calorie intake from saturated fat. On a 2,000 calorie diet, this equates to 11–13 g of saturated fat per day. Therefore, two tablespoons of butter provide more saturated fat than most people should be consuming daily. Eating lots of saturated fats can increase a person’s LDL cholesterol level. As butter contains a lot of saturated fat, people with high cholesterol should be mindful of how much they consume each day. It is suggested replacing it with healthy fat alternatives such as avocados and olive oil. Butter is a high-energy food, containing approximately 715 calories per 100 grams. It has a high content of butterfat, or milk fat (at least 80%), but is low in protein. There are a lot of fat soluble vitamins in butter. This includes vitamins A, E and K2 and minor amounts of calcium, phosphorus, and vitamin D. If you’re eating a healthy diet that includes animals and plants then you are probably getting enough of vitamins A and E already—you’ll get more of both of these nutrients from olive oil. But vitamin K2 is fairly rare in the modern diet and many people don’t know about. Vitamin K2 can have powerful effects on health. It is intimately involved in calcium metabolism and a low intake has been associated with many serious diseases, including cardiovascular disease, cancer and osteoporosis. Butter is one of the relatively few dietary sources for vitamin K2, a nutrient that is important for strong bones. Although, if it’s K2 you’re after, there are better sources, such as natto (a fermented soybean preparation common in Japan) and other fermented foods. 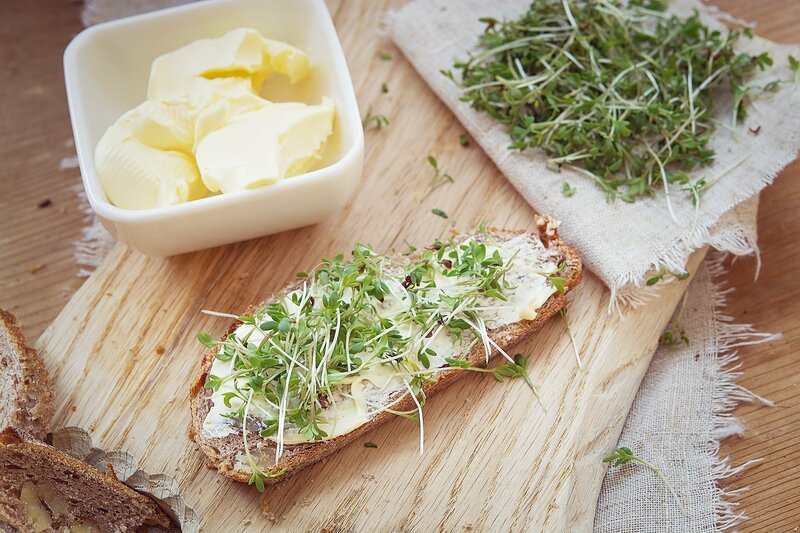 Grass-fed butter may even reduce heart attack risk due to the high Vitamin K2 content. Make sure you get grass-fed butter to get the maximum health benefits. Organic raw grass-fed butter is the best option. The colour of butter is caused by carotene and other fat-soluble pigments in the fat. Butter is full of beneficial short and medium chain fatty acids and CLA. All of which help support your immune system, protect your brain and keep you healthy. Butter is an excellent source of the 4-carbon fatty acid butyrate, which can have various health benefits such as anti-inflammatory, and powerful protective effects on the digestive system such as anti-cancer effects, especially in the gut. The 4-carbon fatty acid butyrate is created by bacteria in the colon when they are exposed to dietary fibre. This may be the main reason fibre has health benefits for humans. So, one way to get more butyrate in your gut is to eat more fibre, which promotes the health of those bacteria. Another way is to eat foods that contain a good dietary source of butyrate, including butter, which is about 3-4% butyrate. Grass-fed butter contains Conjugated Linoleic Acid (CLA) which has been shown to improve body composition in several studies. This fatty acid has powerful effects on metabolism and is actually sold commercially as a weight loss supplement. CLA has been shown to have anti-cancer properties as well as lowering body fat percentage in humans. However, some studies on CLA show no effect on body composition. Medium chain triglycerides (MCTs) are found in butter and other full-fat dairy products but also coconut and palm oil. Although you’ll see a lot about the health benefits of CLA and MCTs online, the research to support these claims has been rather underwhelming, so far. Choline is an essential nutrient that has many important functions in the body, including synthesizing neurotransmitters and protecting neurons. The average intake for this nutrient is only about half of what’s considered to be adequate. Although butter does contain small amounts of choline, whole eggs, meat, fish, and cruciferous vegetables are much better sources. Where your butter comes from (and how the animals were treated) do affect the quality of the product (including vitamin content). Regular or non-grass-fed butter contains significantly less, if any, of these nutrients. When looking for good quality butter, raw and cultured is best. This might be hard to find, however. Organic butter is your next best thing, with store-bought CAFO (concentrated animal feeding operation) butter being at the bottom. But even if you can’t afford (or find) quality butter, commercial butter still outshines the butter “alternatives” any day. Butter should be used in low-temperature cooking since the smoke point is 150-190°C (302-375°F). Butter is one of those foods that can turn bland meals into masterpieces. It is used as a condiment and for cooking in much the same ways as vegetable oils or lard. Butter, with yellow colour, solid consistency, and about 80% fat content, is valued for its sweet flavour, pleasant aroma, and ability to contribute great tenderness to baked products. It is popular for speciality bread, cookies, and pastries and is rolled into doughs from which flaky and tender pastries, such as Danish pastry and puff-paste products, are made. Because of its high cost, it is used, alone or in shortening mixtures, mainly in higher priced baked goods. It is fairly perishable, requiring storage at low temperature, and is not easily creamed (blended with sugar), producing cakes with lower volume and coarser grain than those made with more easily creamed shortenings. Oils that are high in unsaturated fat but low in saturated and trans fats are heart-healthy substitutes for butter. These include avocado, olive, and sunflower oils. Some people use margarine in place of butter, but there is conflicting evidence regarding this replacement. Margarine uses vegetable oil, so it often contains less saturated fat than butter, which contains animal-based fat. However, hard margarine can also contain saturated and trans fats, so it is best to check the nutrition labels. It is possible to quickly compare the nutritional profiles of different butter alternatives. Looking at the nutritional information on food packaging can also help people make healthful choices. The aim should be to limit the intake of saturated and trans fats as much as possible. Butter is high in calories and fat, so people should eat it in moderation or replace it with healthy unsaturated fats. Eating a lot of butter may contribute to weight gain and could play a part in raising levels of LDL cholesterol. A person can continue to enjoy butter in moderation as part of a healthy diet unless their doctor tells them otherwise. While using small amounts of butter occasionally shouldn’t be a problem for most people, there are far healthier fats to be choosing. The clear, unequivocal evidence remains that it is better for our hearts to replace saturated fats with unsaturated fats. Other sources of healthy unsaturated fats include nuts, seeds, oily fish, avocado and plant oils, such as cold-pressed olive, avocado or canola oil. Consider avocado, hummus and nut or seed butter as good options for a less-processed, more whole food approach, or use no spread at all. Rather than focusing on specific foods (such as butter) or nutrients, it’s important for us to focus on the bigger picture – which is our overall dietary pattern. A heart-healthy eating pattern is based largely on minimally-processed foods with plenty of vegetables and fruit. It includes some whole grains in the place of refined grains. It also includes legumes, nuts, seeds, and other sources of healthy fats such as oily fish. It may also contain non-processed lean meats or poultry and/or dairy. It’s true that some intake of polyunsaturated fatty acids is important to our health (take Omega-3 fatty acids for example), but excessive intake is actually linked to chronic disease. It’s really about balance. In fact, excessive consumption of these oils is actually linked to cancer, heart disease, damage to bodily organs, impaired growth and obesity. Best for: It is used as a condiment and for cooking. It is popular for speciality bread, cookies, and pastries and is rolled into doughs from which flaky and tender pastries, such as Danish pastry and puff-paste products, are made. Not recommended for: Butter should NOT be used in High-temperature cooking since the smoke point is 150-190°C (302-375°F). Butter in small amounts is fine, but it may cause problems if you eat way too much (for example, by adding a few tablespoons to your morning coffee). Plus, it is not as healthy as extra virgin olive oil, which is the world’s healthiest fat. Pros: Butter has substantial amounts of vitamins A, E and K2 and minor amounts of calcium, phosphorus, and vitamin D. It also contains carotene, short and medium chain fatty acids, butyrate and CLA. All of which help support your immune system, protect your brain and keep you healthy. Cons: Real butter does not contain any trans fats. However, it does contain high levels of saturated fat, which can contribute to high blood cholesterol levels and heart disease if not eaten in moderation. Butter is a high-energy food, containing approximately 715 calories per 100 grams but is low in protein. Note1: For a product to be called butter, it must be derived exclusively from milk and ingredients that are obtained from milk, including at least 80% milk fat. It may also contain water, salt, lactic acid producing microorganisms and flavour-producing microorganisms. When you see products in the grocery store that are packaged up like butter, or use words such as “butter-flavoured” without specifically stating the product is butter, it’s likely they have been altered in such a way that it no longer meets the content requirements above. Note2: Make sure you get grass-fed butter to get the maximum health benefits. Organic raw grass-fed butter is the best option. How to store: It is fairly perishable, requiring storage at low temperature.